A boutique winery located at the crossroads of Closson and Chase Roads north of Wellington; featuring world class Chardonnay and Pinot Noir wines by winemakers Deborah Paskus and Keith Tyers. Set in the limestone rich soils of Hillier, over 35 acres of our estates is planted in classic Burgundian Chardonney, Pinot Noir, and Pinot Gris. 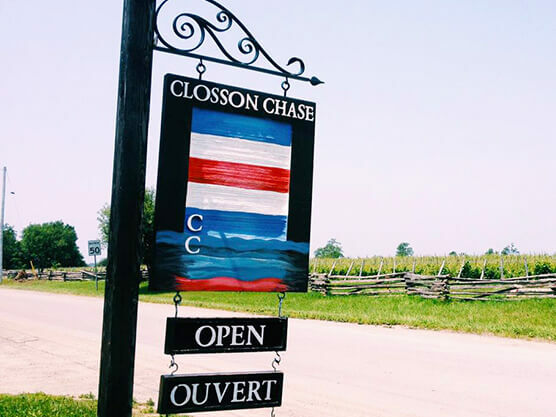 Closson Chase is a quality-driven producer that helped spearhead the birth of the Prince Edward County wine industry, using centuries-old European traditions & sustainable, innovative techniques to create world class wines using only the finest Chardonnay & Pinot Noir grapes. French inspired vinification and careful barrel ageing from small yields deliver exceptional wines.